If your high-tech ball seems sluggish lately, shock it back to life with the energizing effects of this high-powered cleaner. It was approved for use during ABC/WIBC competition. Made of a biodegradable, citrus-based, strong degreasing formula, this cleaner removes lane oil, dirt, belt marks, and even tape residue. This cleaner is suited for use on all Reactive Resin and particle technology coverstocks. Great product.best on the market!!!!!!!! Does a Great job removing lane oil and ball return dirt off your ball. Cleans bowling ball effectively and has a gentle citrus scent. 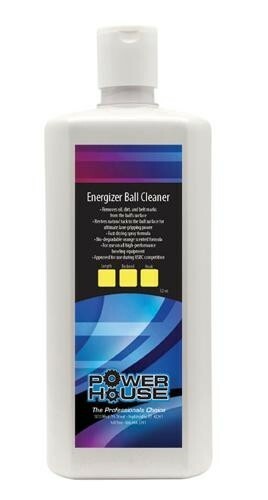 Due to the time it takes to produce the Powerhouse Energizer Ball Cleaner Quart ball it will ship in immediately. We cannot ship this ball outside the United States.